The Principality of Monaco is situated on the Cote d’Azur about 25 minutes from Nice and 45 minutes from Cannes. Its exceptional location allows it to enjoy 310 days of sunshine per year. The main airline companies fly from the major European capitals to Nice Cote D’Azur airport, arriving at this destination in about one hour and a half on average. Monaco’s exceptional location, between mountain and sea, its gardens, its athletic and cultural events...all qualities which make it the ideal destination for an unforgettable conference. Exceptional infrasctructure, proven expertise, surroundings that stimulate the imagination., Monaco is the ideal setting for gatherings of up to 2000 people. Traditional expertise in the field of hospitality and tourism. The Principality offers a widerange of facilities for congresses, conventions and gala, having in a radius of 200 metres, five luxury hotels, several nights clubs, cinemas, luxury boutiques, and the most famous Casino of the world. In few words the astonishing concentration of these poles of interests make of Monte Carlo the ideal town for the organisation of any event combining the useful with the pleasant. Monaco is also an important shipping center, indeed in the territory we have the presence of several vessels managing companies, charteres, marine insurances and surveyors and important company of brokerage. An independent state in the heart of Europe, the Principality of Monaco offers investors and businessmen an exceptional lifestyle. In 1997, Monaco was dressed up to the nines for the 700th anniversary of the Grimaldi Family Dynasty. In 1993, the Principality of Monaco becomes the 183rd State Member of the United Nations. 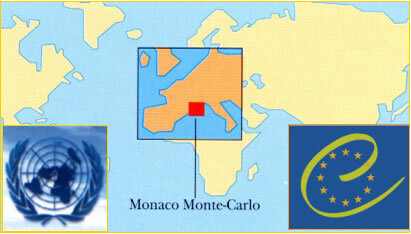 In 2004, the Principalyty of Monaco becomes the 46th Council of Europe member state. The Nice-Côte-d'Azur International Airport , located 22 kilometers from Monaco, links the Principality to the major cities of the world. Confortable and rapid travel is ensured by numerous direct flights. It handled 6,6 million passengers in 1996, and international passenger figures increased by 20.7% in 1996, surpassing European airports such as Geneva and Lisbon. There are 2 terminals, one for international flights and the other for domestic flights The current expansion programme will bring its capacity to 10 million passengers by the year 2006. The Principality is only 7 minutes away from the airport if you take one of the numerous daily helicopter flights. During the flight, you will discover the most beautiful shores of the Côte d'Azur. Upon arrival, a shuttle will take you to your desired destination. The Principality of Monaco is an independent state which is easily accessible by all of its land borders. Monaco is linked to France and other European nations by a network of highways. The A8 motorway, which connects with the whole of European motorway system, serves the Principality by means of easy access roads (an exit A8 - RN7 coming from Nice, Monaco going to or coming from Nice, Roquebrune going to or coming from Italy. Large cruise ships can dock in Monaco. The Principality's two ports are equipped to greet pleasure-boats : The Port Hercule, is 39.52 square acres. This legendary port offers mooring and anchoring possibilities for five hundred vessels some of which are extremely large. With the growing development of maritime tourism, Monaco is today the starting point or terminus for many Mediterranean cruises. Monaco's shores, in summer, are fantastic viewpoints for its international fire-work competitions. The Port of Fontvieille integrated into the new district, can receive in its 19.76 acres of water as many as 60 vessels of at least 30 meters in length. At close proximity, the Port of Cap d'Ail is also a choice destination for pleasure-boats. The Principality of Monaco with its world famous Rock lies between France and the Mediterranean Sea. The prestige and the fame of this attractive territory, landlocked within the French département of Alpes-Maritimes, spread much further than its borders, which the French writer Colette described as being "made of flowers". Its space is limited (195 ha. ), but the site is enchanting and unfolds along a narrow coastal strip four kilometres long, bounded by the mountainous foothills of the Tête de Chien and Mount Agel. The city is made up of four districts: Monaco-Ville, the historical seat of the Principality, situated upon the Rock where the Prince's Palace stands, Monte-Carlo, the district surrounding the Casino, La Condamine, around Port d'Hercule, Fontvieille, the new industrial district, built on ground gained from the Sea (22 ha.). In spite of such an exiguous territory, Monaco is a land brimming with History, its origins lost in the mists of time. Since earliest antiquity, men have yielded to the charms of this natural shelter, where abrupt cliffs furrowed with caves once served as refuge for primitive tribes of the prehistoric era. This wind-sheltered enclave, enjoying an exceptionally mild climate, witnessed a succession of conquering civilisations from the Mediterranean Basin. Here begins the incredible and very long history of the Grimaldis, a dynasty which has shaped the identity of the now legendary Rock and which has reigned for more than seven centuries over one of the smallest States in the world. For several centuries, was coveted by the enemies of the Grimaldi and for this reason for nearly 400 years, the Rock maintained its character as a fortress. During the centuries, the military structures of the Palace were retained but the interior was totally altered so as to house the superb collections of paintings by master artists, tapestries and precious furniture. Inside you could admire the great gate constructed on 1960, that opens on to the Court of Honour, admirable in its proportions, with its double stairway in Carrara marble leading to the Gallery of Hercules. The Court of Honour was paved with 3 million white and coloured stones forming immense geometrical figures. Every day, at midday, the ceremony of the Changing of the Guard is performed by the section of the carabiniers responsible for guarding the Prince's Palace. It takes place on the Palace Square, using a ceremonial involving a great deal of marching and counter-marching which evokes the admiration of the large number of tourists. In order to understand the history of the Principality it is necessary to visit the charming center of Monaco-Ville. The narrow streets of the Old Town, interconneted by vaulted passageways, are lined with centuries-old houses and the area has retained its Medieval character. A romantic walk through the Saint-Martin Gardens, facing the sea and inspired the famous poet Guillaume Apollinaire between 1887 and 1889. During the trip it is possible to visit the Chapelle de la Paix, the façade of the Law Courts, in the Italian Gothic Style and this picturesque district leads to the beautiful Place du Casino with its imponente Prince’s Palace. This is one of main attractions for tourists in the Principality (it houses the collections made during the course of numerous cruises of this "Scientist Prince" whose work provides the basis of modern oceanography). It was inaugurated in 1910 by its founder, Prince Albert I. This an exceptional museum is a monumental architectural master-piece with a grandiose façade rising sheer above the sea to a height of 85 metres. It took eleven years to built, using 100.00 tons of stone from la Turbie. One of the vocations of the Museum is to welcome scientists from all over the world who have 2,000 square metres of laboratories at their disposal. On the ground floor, the collections on show represent the complete range of marine and submarine fauna with the often gigantic skeletons of oceanic mammals. Also to be seen are the diving saucers and other equipment used during his researches by Commandant Jacques-Yves Cousteau, Director of the Museum until 1988. On the first floor there are models of the various ships used by Prince Albert I for his explorations and the laboratory, reconstructed full-scale, of "Hirondelle II", his favourite yacht. There is also a hall devoted to oceanographic research, considered to be one of the most complete in the world. Finally, the aquarium, one of the most spectacular in Europe, with nearly 4,000 fish (around 350 different species) occupying 90 basins. The Museum also houses a meteorological station and a seismological observatory. The Cathedral of Monaco, entirely built in 1875, like the Clock Tower of the Prince's Palace, of white stone from la Turbie, is dedicated to the Immaculate Conception. It has three naves and an ambulatory where the sepultures of past Princes and the beloved Princess Grace are to be found. The pillars are of granite and porphyry of various colours and the main altar of Carrara marble. To be seen also the mosaic of the cupola and the windows designed for the most part in the style of XIIth century. Prince Honoré II (1597-1662) laid the first stone of this in 1639. It was not, however, finished until 1646 and immediately became the seat of the Fraternity of Black Penitents of whom Prince Honoré II was the first Prior. To be seen is the main altar in coloured marble, which came from the Church of St Nicholas (the old Parish Church of Monaco from 1321 to 1874, the year in which it was demolished in order to make room for the present Cathedral) as well as a group in marble from the beginning of the XVIIIth century representing the Virgin and Angels. Facing the Albert I College, Government House was inaugurated in June 1894 by Prince Albert I. It is the residence of the Minister of State and the headquarters of the Monégasque high administration and is located on the site of the building called the Lonely House which Prince Antoine I had built in the first years of the XVIIIth century in order to allow his wife, Princess Marie de Lorraine, to escape from the frivolities of the Court. Laid out in the 1830s, in the reign of Prince Honoré V, they lie on both sides of the Oceanographic Museum. Here Nature suffers no restraint. At one bend, unexpectedly, there is a terrace between the sky and the sea where there stands, sculpted in bronze, the monument erected to the memory of Prince Albert I. The gardens of St Martin and those of Fort Antoine, at the eastern end of the Rock, were a source of inspiration to Guillaume Apollinaire, who resided in the Principality from 1887 to 1899.